2 in Ôsaka (Shôchikuza), 7 shows in Tôkyô (Kabukiza, National Theatre, Asakusa Kôkaidô, Shinbashi Enbujô) and 1 in Kyôto (Kyôto Gekijô)! Living National Treasure Sakata Tôjûrô, Nakamura Ganjirô, Nakamura Senjaku, Kataoka Ainosuke, Bandô Yajûrô, Kamimura Kichiya and Nakamura Kazutarô perform at the Shôchikuza! Living National Treasure Nakamura Kichiemon, Living National Treasure Nakamura Tôzô, Matsumoto Hakuô, Nakamura Shikan, Matsumoto Kôshirô, Nakamura Jakuemon, Ichikawa Ennosuke, Nakamura Shichinosuke, Nakamura Baigyoku, Nakamura Kaishun, Nakamura Fukusuke, Kataoka Hidetarô, Nakamura Karoku, Nakamura Matagorô and Ichikawa Komazô perform at the Kabukiza! Ichikawa Ebizô, Kataoka Takatarô, Ichikawa Sadanji, Ichikawa Udanji, Nakamura Shidô and Nakamura Kotarô perform at the Shinbashi Enbujô! The Zenshinza troupe perform at the Kyôto Gekijô! The traditional two programs for the New Year Grand Kabuki at the Shôchikuza with a troupe led by Living National Treasure Sakata Tôjûrô. Tsuchiya Chikara: this play is a specialty of the Nakamura Ganjirô family and features the distinctive flashy acting of Kansai actors. This month it will be performed by the younger members of this acting line. One of many stories set on the theme of the revenge of the forty-seven loyal retainers features a lord named Tsuchiya Chikara (Nakamura Senjaku) who lives next door to the enemy of the loyal retainers and is disgusted because they do not seem to be interested in avenging the death of the lord. He learns from his haiku teacher that Ôtaka Gengo (Kataoka Ainosuke), one of his students who should be part of the vendetta left a poem suggesting that he was forgetting his former lord and going to take service with another samurai lord. But in fact, this poem is a riddle hiding the secret of the vendetta. Featuring also Bandô Yajûrô and Nakamura Kazutarô. Sakae Kotohogu Fuji no Suehiro: This is a dance celebrating Living National Treasure Sakata Tôjûrô's 88th birthday performed by himself, his sons, Nakamura Ganjirô and Nakamura Senjaku, and his grandsons, Nakamura Kazutarô and Nakamura Toranosuke. The Empress appears in the palace at the time of the spring festival. A crane and a tortoise dance in front of her to celebrate longevity; the crane is believed to live for 1,000 years while the tortoise is said to live for 10,000 years. 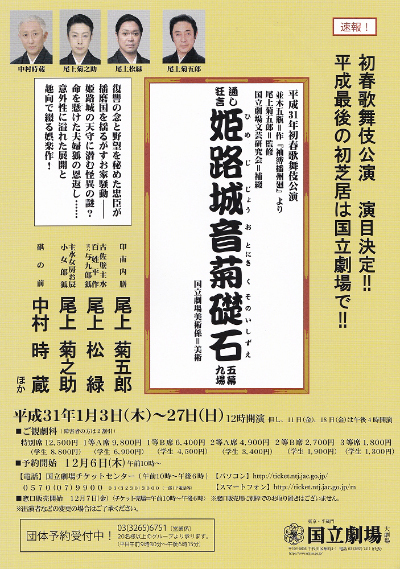 Kawashô: this late love suicide play by Chikamatsu Monzaemon is considered by many to be his masterpiece. The paper seller Jihê (Nakamura Ganjirô) is in love with the courtesan Koharu (Nakamura Kazutarô) and all those around them are afraid that they will commit love suicide. Jihê’s wife Osan urgently pleads with Koharu to pretend that she does not love Jihê any more, in order to save his life. In the first and most famous scene in the Kawashô teahouse, Jihê’s brother Magoemon (Bandô Yajûrô) masquerades as a samurai to find out Koharu’s true feelings. Jihê listens in from the outside and is astonished to hear her say that she does not want to commit love suicide. In a rage, Jihê breaks off all relations with her, while Magoemon is moved to learn that she has done this out of consideration for Osan’s feelings. This play is a classic example of the Ôsaka style of acting. Kinmon Gosan no Kiri: this is a historical play about Ishikawa Goemon, a legendary thief in the 16th century. Sô Sokei, a retainer of the late Ming Emperor, plots to take over Japan, but his plan is discovered and he commits ritual suicide by disembowelment. As Ishikawa Goemon sits on the upper story of Nanzenji Temple's gate in Kyôto admiring the fine view, a white hawk flies to him with a cloth on which Sô Sokei's testament is written. He learns that both his natural father Sô Sokei and his foster father Takechi Mitsuhide were destroyed by Mashiba Hisayoshi (known in history as Toyotomi Hideyoshi) and he vows to avenge them by killing Hisayoshi, now the ruler of Japan. Just then, Hisayoshi appears disguised as a humble Buddhist pilgrim. Finally, Goemon is surrounded by Hisayoshi's retainers, but Goemon and Hisayoshi exhibit generosity towards each other and promise to fight later again on the battle field. Starring Kataoka Ainosuke and Nakamura Ganjirô in the roles of Goemon and Hisayoshi. Revival at the National Theatre of Namiki Gohei I's 1780 drama "Sode Nikki Banshû Meguri". This Otowaya-powered revision is entitled "Himeji-jô Oto-ni Kiku Sono Ishizue". Himeji-jô Oto-ni Kiku Sono Ishizue: Himeji Castle is one of those registered first as a World Cultural Heritage in Japan. The legend that Princess Osakabe, a demoness with a twelve-layered ceremonial robe and a red hakama skirt, appears at the castle tower of the Himeji Castle has been passed down from old times and has been adapted for many Kabuki works. This month’s performance is based on Namiki Gohei’s "Sode Nikki Banshu Meguri". It combines that legend and a story in which a fox pair repays favor from a samurai’s family and depicts internal troubles in a daimyo’s family in Harima domain (present day Hyôgo Prefecture). The playbook is revised retaining the feature of the original. In Muromachi period under the rule of the 8th shogun Ashikaga Yoshimasa, as the Momonoi clan, the lord of the Harima domain, is inquired why the heir frequents the pleasure quarters and declines the audience of Shôgun on the pretext of having lost the heirloom to be presented to the shogunate and being ill, the chief retainer Innami Naizen saves the Momonoi clan. Shogunate praises Naizen’s loyalty, but in fact he burns with vengeful thoughts and ambition. The lord, the heir and their loyal retainer Kosakabe Mondo fall victims to his evil scheme and he takes over the Momonoi clan. The lord’s widow Kinuta-no-Mae struggles to levy warriors to restore the fallen Momonoi clan making use of the rumor that ghost appears in the ruined Himeji Castle. Mondo revives and disguises himself as a farmer Heisaku. He protects the orphans of the Momonoi clan and related people from the evil factions with his wife Otatsu. A fox pair Yokurô and Kojorô who want to repay favors from the Momonoi clan contribute to that. Where have the lost heirlooms gone? Will Naizen succeed in his revenge and realize his ambition or will the Momonoi clan be restored? Featuring Living National Treasure Onoe Kikugorô as Innami Naizen, Nakamura Tokizô as Kinuta-no-Mae, Onoe Shôroku as Kosakabe Mondo and fox Yokurô, and Onoe Kikunosuke as Otatsu and fox Kojorô. 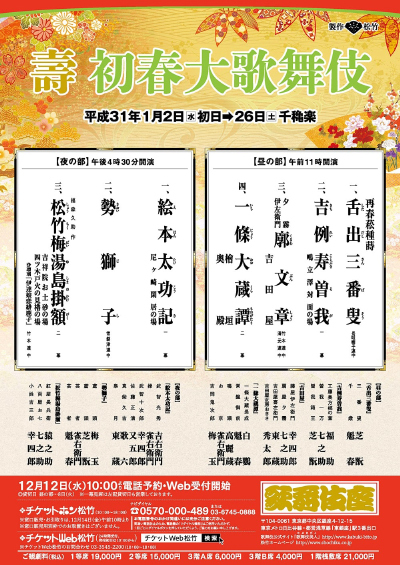 The traditional two programs for the New Year Grand Kabuki at the Kabukiza. Based on the ritual play "Okina" in the Nô theatre, the sanbasô is both an important prayer for prosperity and a vigorous dance. This particular version takes its title from the sanbasô sticking his tongue out. Some say that this is from absorption in the joy of his dance. Others say that this is an auspicious sign. In any case, this vigorous and joyful dance is exhilarating to watch and is a perfect addition to this auspicious program. Staring Nakamura Shikan (the sanbasô) and Nakamura Kaishun (the senzai). 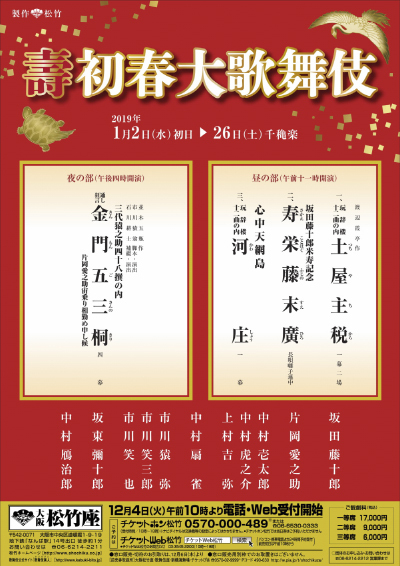 Shigitatsusawa Taimen: this piece is an act of a history play based on the legend of the Soga brothers' vendetta and performed as a festive play to celebrate the New Year. Kudô Suketsune's wife Naginoha (Nakamura Fukusuke) comes to Ôiso to visit Izusan Shrine and Hakone Shrine on behalf of her busy husband. Ichiman (Nakamura Shichinosuke) and Hako'ô (Nakamura Shikan) appear to avenge their father who was killed by Suketsune. Naginoha tells them to wait for the chance and gives them the pass to enter the hunting ground which Suketsune left her. Yoshidaya: the roots of this play go back to the earliest days of Kabuki. Izaemon, the son of a wealthy family, has been disowned for loving a courtesan and now has nothing but a paper kimono. This role is a classic example of the wagoto or soft style of acting that is one of the representative acting styles of the Kansai region. Matsumoto Kôshirô stars as Izaemon. Featuring Nakamura Shichinosuke as his lover, the courtesan Ôgiya Yûgiri (Izaemon's lover), and Living National Treasure Nakamura Tôzô and Kataoka Hidetarô as the proprietor and proprietress of the Yoshidaya teahouse. Ichijô Ôkura Monogatari: the world is ruled by Taira no Kiyomori, the leader of the Heike clan. Tokiwa Gozen, the widow of the head of the defeated Genji clan and mother of Yoritomo and Yoshitsune, the future leaders of the clan, has become the mistress of the dictator Kiyomori, then the wife of Lord Ôkura, a seemingly simple-minded fool who spends all his time watching pretty women dance. Outraged members of the Genji clan sneak into Lord Ôkura's mansion only to discover that Tokiwa Gozen's immorality and Lord Ôkura's idiocy are a guise, the only way to survive in a world ruled by the enemy. This performance stars Matsumoto Hakuô as Lord Ôkura, Nakamura Kaishun as Tokiwa Gozen, Nakamura Baigyoku as Yoshioka Kijirô and Nakamura Jakuemon as Yoshioka's wife Okyô. Amagasaki Kankyo: Akechi Mitsuhide (known in this play as Takechi Mitsuhide) is known as the "three day ruler of Japan", having only control for a brief time after attacking and killing Oda Nobunaga (known in this play as Harunaga) and before being defeated in turn by Toyotomi Hideyoshi (known in this play as Mashiba Hisayoshi). In the most famous act of this play, after assassinating Harunaga, Mitsuhide comes to see his mother, but she refuses to forgive him for betraying his lord. Mitsuhide sees his son and mother both die before his eyes as he tries to defeat his rival Hisayoshi, but instead is confronted with the drama of his own immediate family. Starring Living National Treasure Nakamura Kichiemon and Nakamura Karoku as Mitsuhide and Hisayoshi. Featuring also Nakamura Jakuemon, Matsumoto Kôshirô, Living National Treasure Nakamura Tôzô and Nakamura Matagorô as Mitsuhide's wife Misao, Mitsuhide's son Jûjirô, Mitsuhide's mother Satsuki and Satô Masakiyo. Kioi Jishi: this dance shows an Edo festival with its lively lion dance and other entertainments. The festival is full of handsome firemen and attractive geisha who do a series of graceful dances. One of the highlights of this dance is the story of the Soga brothers avenging the death of their father by attacking their enemy during a hunting party for the Shôgun at the foot of Mt. Fuji. Starring Nakamura Shikan, Nakamura Baigyoku, Nakamura Jakuemon and Nakamura Kaishun. Yushima no Kakegaku: Oshichi was a grocer's daughter who fell in love with a temple page named Kichisaburô when her family took refuge in a temple after a fire. She so wanted to see him that she set a fire, even though the penalty for arson was death. The story of Oshichi is famous in many theatrical versions, but this particular one features the antics of the middle-aged man Beniya Chôbê (commonly called Benchô) who is in love with her. Starring Ichikawa Ennosuke as Benchô, Nakamura Shichinosuke as Oshichi and Matsumoto Kôshirô as Kichisaburô. The traditional New Year Kabuki at the Shinbashi Enbujô with a troupe led by the young star Ichikawa Ebizô. This is a short scene showing the troubles of Yoshitsune after his brother Yoritomo, the Shôgun, turns against him. Yoshitsune (Ôtani Tomoemon) is forced to flee from the troops sent by his brother Yoritomo. The trip will be hard and he decides he must leave behind his lover Shizuka Gozen (Ôtani Hiromatsu), despite her passionate pleas to remain with him. As a reminder of himself, he presents her with a precious hand drum that he had received from the emperor. Yoshitsune's retainer Tadanobu (Nakamura Shidô) rescues Shizuka from Yoritomo's troops and Yoshitsune decides to have Tadanobu protect her on the road, not knowing that this Tadanobu is actually a magical fox in disguise. Banzui Chôbê: in the early Edo period, gallant men like Banzuiin Chôbê led the commoners. But this incurred the wrath of members of the samurai class, who were theoretically in control. This play begins with a recreation of Kabuki in its earliest days, then a fight breaks out which is settled by Chôbê (Ichikawa Ebizô). But this frustrates the ambitions of the samurai Mizuno (Ichikawa Sadanji) who invites Chôbê to visit. All of Chôbê's men tell him not to go because it is a trap, but Chôbê decides to meet his end and bids farewell to his wife (Kataoka Takatarô) and son. Finally, Chôbê is killed when he is defenseless in the bath. Featuring also Ôtani Tomoemon, Kataoka Ichizô, Ichimura Kakitsu, Ichikawa Sai'nyû, Ichikawa Omezô and Ichikawa Kudanji. Mimasu Kuruwa no Kasauri: set in Edo, this newly-created dance (2015) is centered around an umbrella seller (Ichikawa Ebizô) in the Yoshiwara pleasure district. With his fine wares and irresistible charisma, the umbrella seller charms passers-by into buying his umbrellas, and conducts a brisk business until he's beset by ruffians who want a piece of his profits. However, their attempt at intimidation backfires when the umbrella seller reveals himslef to be Ishikawa Goemon, Japan's greatest thief and outlaw. Narukami: one of the most popular and universally appealing plays in the Kabuki Jûhachiban collection of plays featuring the bombastic aragoto style of acting. The holy man Narukami (Ichikawa Udanji) is angry at the Imperial Court and has taken refuge in the mountains where he has imprisoned inside a waterfall the dragon that brings rain, bringing a severe drought to the country. Princess Taema (Nakamura Kotarô) is sent by the Imperial Court to try to seduce Narukami, destroying his magical powers and release the rain. When he finds that he has been betrayed, anger transforms Narukami into a Thunder God. Natorigusa Hana no Jûichidai: This is a brand-new dance commemorating the 110th anniversary of the birth of Ichikawa Danjûrô XI. A handsome fireman chief (Ichikawa Ebizô) and a chic and vivacious geisha (Kataoka Takatarô) appear in town as the air resounds with festival music. A sweet tekomai dancer and other firemen chiefs join them and all perform a lively and spirited dance. Shunkan: the priest Shunkan (Ichikawa Ebizô) has been exiled to Devil's Island for plotting against the dictator Kiyomori. A pardon is given to his fellow conspirators, but Shunkan is only saved by an additional pardon given by Kiyomori's compassionate son. Even so, he gives up his place on the boat to freedom so his companion's new wife can accompany her husband back to the capital. The boat leaves and Shunkan is left watching is disappear in the distance, knowing he will be left on the island forever. Featuring Kataoka Ichizô as the evil emissary Senoo and Ichikawa Udanji as the merciful envoy Tanzaemon. With Nakamura Kotarô as the island girl Chidori, Ichikawa Omezô as Taira no Yasuyori and Ichikawa Kudanji as Fujiwara no Naritsune, Shunkan's fellow exile who has fallen in love with her. Kagami Jishi: one of the most important dances for onnagata female role specialists and is an audience favorite. The maidservant Yayoi performs an auspicious lion dance for the Shôgun in his opulent palace, but she gradually finds herself under the control of the lion spirit. In the second half of the dance, the lion spirit itself appears and performs its crazed dance among peonies and fluttering butterflies. Starring Ichikawa Ebizô as both Yayoi and the spirit of the lion. 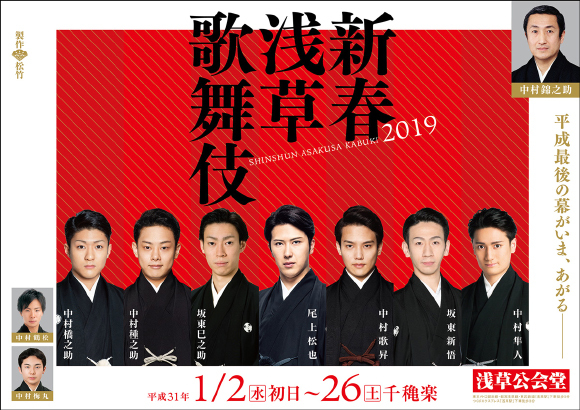 The yearly show for young promising actors at the Asakusa Kôkaidô in Asakusa, a lively and colorful neighboorhood that keeps the scent of old Edo. Otoshidama: a special kôjô for new year greetings (nenshi goaisatsu in Japanese). Modori Kago: two palanquin bearers, one from Ôsaka, the other from Edo (pre-modern Tôkyô), decide to stop and rest. As they do so, each boasts of the respective merits of his native town. Finally, the little apprentice courtesan (kamuro) they have been carrying, alights from the palanquin and joins them in their dance. Featuring Nakamura Kashô as the palanquin bearer from Ôsaka (in reality Ishikawa Goemon), Nakamura Tanenosuke as the palanquin bearer from Edo (in reality Goemon's arch-enemy Mashiba Hisayoshi) and Nakamura Umemaru as the kamuro. Yoshikata Saigo: the full-length play shows the early rise of the Genji clan after a time of oppression. Yoshikata (Onoe Matsuya) is the lone member of the Genji clan and pretends to have no interest in reviving its fortunes, but Yukitsuna (Nakamura Hayato) a good-humored footman who is actually a spy, realizes his true intentions. Yoshikata is about to have a son, the general Yoshinaka, who will lead the Genji to victory, but Yoshikata himself is attacked and surrounded and dies in a spectacular scene where he falls from the top of a flight of stairs. The widow of the Matsugae family who reigns over the district gives a dance party to choose a husband for her daughter Midori Gozen (Bandô Shingo). They plan to choose the man who dances the best. Tôgorô (Bandô Minosuke) the potato digger comes with his friend Jirokurô (Nakamura Hashinosuke) pretending to be the best dancer in Japan. In contrast to Tôgorô, Jirokurô is a good dancer and he knows that Tôgorô is ardently in love with Midori Gozen. Jirokurô wears a mask and dances pretending to be Tôgorô. Then asked to dance without a mask, Tôgorô dances badly. The widow accepts Jirokurô's suggestion and orders Midori Gozen to dance with Tôgorô and Jirokurô. Unable to dance well, Tôgorô begins to express potato digging in dance. The people have never seen such an interesting dance and praise his dance to be the best in Japan. Tôgorô reveals his true identity and apologizes to them, but Midori Gozen would rather marry Tôgorô the potato digger than the best dancer. Finally they all dance expressing potato digging and congratulate Tôgorô and Midori Gozen. Soga no Taimen: this is one of the oldest and most classical of all Kabuki plays. In the Edo period, every January, plays appeared about the vendetta carried out by the Soga brothers Jûrô and Gorô after eighteen years of hardship. In "Soga no Taimen" the brothers confront Kudô Suketsune, the man responsible for their father's death. More ceremony than play, it features each of the important Kabuki character types, including the bombastic aragoto style of Gorô and the soft wagoto style of Jûrô. 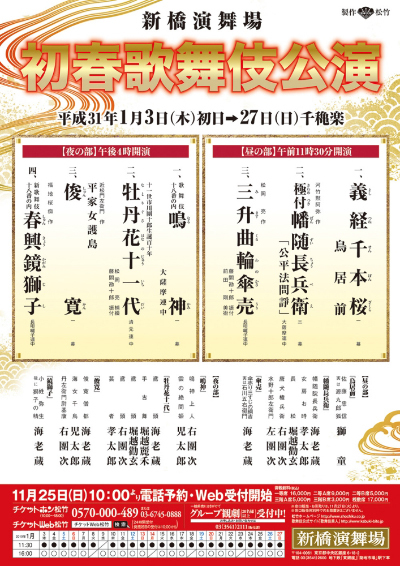 This month features a cast headed by Nakamura Kinnosuke as Kudô and some of the most popular young stars in Kabuki with Onoe Matsuya as Gorô and Nakamura Kashô as Jûrô. 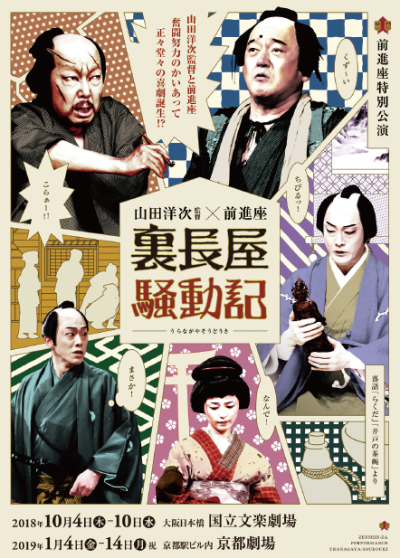 Featuring Bandô Minosuke, Nakamura Umemaru, Bandô Shingo and Nakamura Hayato as Kobayashi no Asahina, the courtesan Kewaizaka no Shôshô (Gorô's lover), the courtesan Ôiso no Tora (Jûrô's lover) and Oniô Shinzaemon (Jûrô's retainer). Banchô Sarayashiki: the story of Okiku, who became a ghost after breaking one of a precious set of plates and being killed in punishment by a quick-tempered lord, is one of the most famous in Japanese tradition. But this is a modern play, which transforms the ghost story into a portrait of the interaction of contrasting and incompatable personalities. The samurai lord Aoyama Harima (Nakamura Hayato) is passionate and quick to fight and is in the middle of a fight when he is stopped by his aunt. She has arranged a marriage for him and Harima is unable to admit that the reason he will not marry is because he is deeply in love with Okiku (Nakamura Tanenosuke), a lady-in-waiting in his household. As strong as Harima is, his aunt's will is much stronger. But this makes Okiku wonder about the strength of Harima's love for her and she tests him by breaking one of a set of heirloom plates. When she tests Harima's feelings, this seals her fate and sets the tragedy of the play in motion. Noriaibune: at the new year a group of merrymakers happen to meet on a ferry boat. They include a pair of manzai entertainers, who would go from door to door performing auspicious songs and dances. Featuring all the young actors. The traditional Zenshinza New Year performances in Kyôto. Not at the Minamiza, as it used to be, but at the Kyôto Gekijô. "Ura Nagaya Sôdôki", which was written by the veteran movie director Yamada Yôji and was premiered in May 2017 at the National Theatre, is based on two famous rakugo stories, "Rakuda" and "Ido no Chawan".